I usually like to share a spring home tour with you every year but I wanted to do something a little different this year. 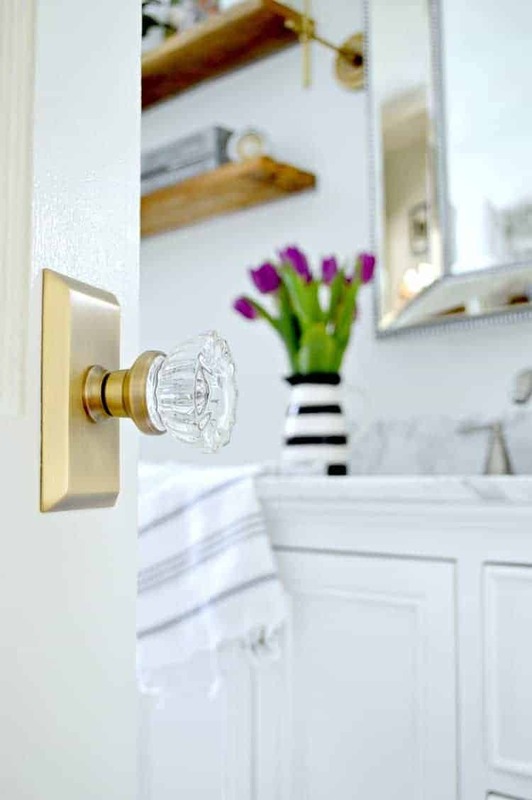 Most spring home tours are all about the pretty spring touches that are sprinkled around the house. Lots of flowers and a change of bedding and pillow covers are the usual fare but, to me, getting the house ready for spring (and summer) isn’t just about flowers. Yes, I love adding fresh flowers around the house (if you want to see more check out my Instagram) but spring also means that it’s time to freshen the house. For me the only way to do that is to give it a good cleaning. So, I’m not only sharing my spring home decor but also how I get my house ready for spring. My spring home cleaning ritual usually starts with the changing of bedding. I don’t go by the calendar when I’m changing bedding but by the temps outside. Once we turn the heat off, I know its time to get my spring and summer bedding out. This is a good weekend job that starts with stripping the whole bed and throwing it in the wash. While that’s going, I vacuum the mattress and as much of the boxspring as I can. I also give the bed frame and headboard a cleaning and we spin our mattress. After the linens are clean and dry, I make the bed and bring out the clean bedding that was put away in the fall. There’s nothing like slipping under cool, crisp sheets after your bed is all clean and ready for spring. This is, by far, my least favorite task to do when I’m getting ready for spring and summer. Besides cleaning the glass, the blinds all get vacuumed and cleaned as well. I hate every minute of it while I’m doing it but, once it’s done, I’m glad I did it. 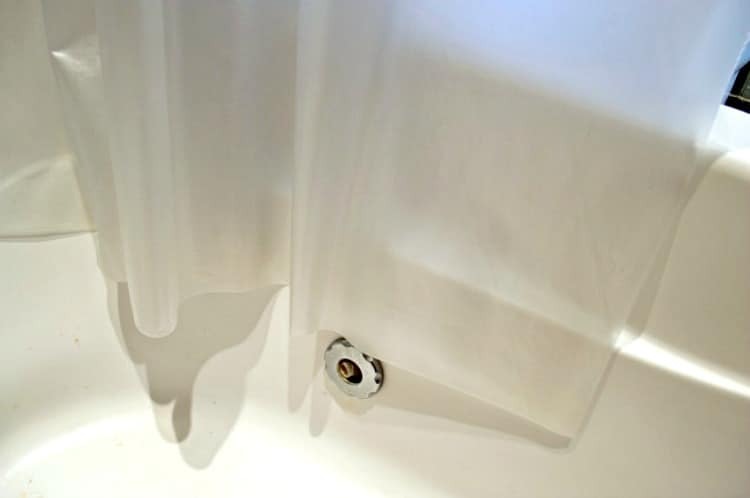 I clean the bathroom on a regular basis but when I’m spring cleaning, I like to take the shower curtain down and run the it through the washing machine (you can see how I do it here). I also wash the fabric shower curtain as well as the bathroom rug. We have a small house, with only 3 closets, so I’m only able to have clothes out for one season at a time. When I bring out the warm weather clothes and pack up the winter ones, I always do a quick inventory. Things that haven’t been worn in a year get donated and I make sure everything is clean and there are no holes or tears. It’s a pain to do but it’s a good way to keep my small closet in order. Spring is a great time to give the floors a good cleaning. We don’t wear shoes in our house and vacuum regularly so it ends up being a quick and easy job. I also like to give our area rugs a good cleaning by moving all the furniture off of it and vacuuming. Not only do I clean the inside of the house but I also go outside to do a thorough cleaning of the front porch. That means dragging the hose up and hosing down the walls, windows and porch. The chairs get a good shower too, since they’re waterproof, and the IKEA cabinet gets wiped down with a wet towel. Once everything is clean and dry, I add a pretty spring basket. Of course, the best part of getting the house ready for spring is getting the “pretties” out. For me, that usually means changing the heavy winter pillow covers for lighter, more spring-like pillow covers. I also love adding fresh flowers. I’ve given up buying snacks at the grocery store so I can get a small bunch or two of fresh flowers once a week. I try to keep the budget at $10-$12 weekly, and I will spend even less if I can get to Trader Joe’s. 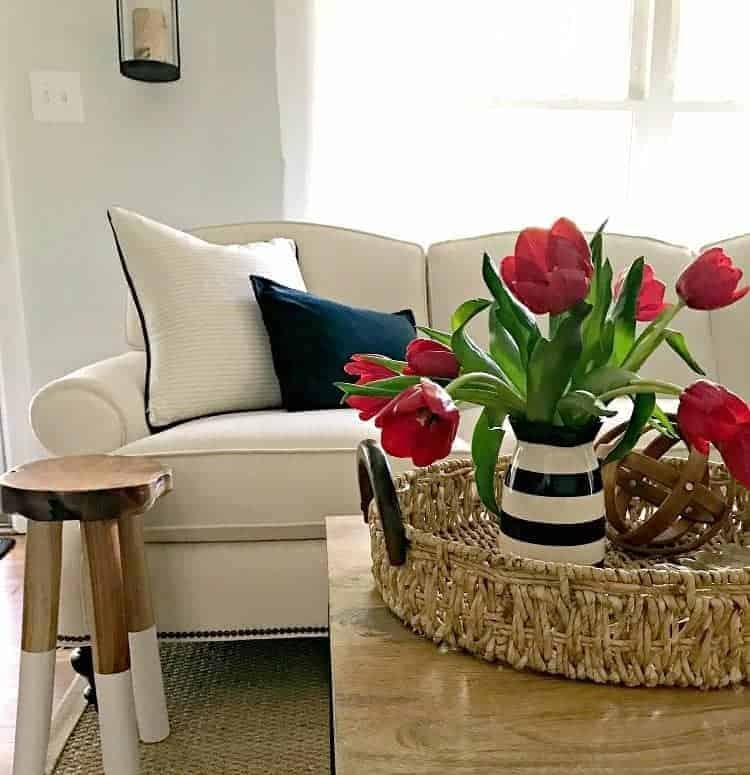 Spring is my favorite season and I love adding spring touches to our home but the cleaning part? Not so much. Although I don’t like doing it I love how the house feels when I’m done. I think it’s worth it. 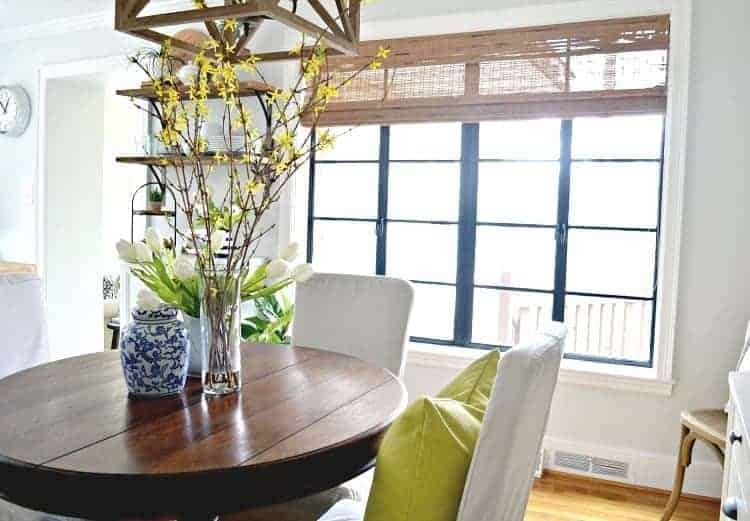 What do you do to get your home ready for spring? Everything looks fresh and clean and pretty. Love your tulips! 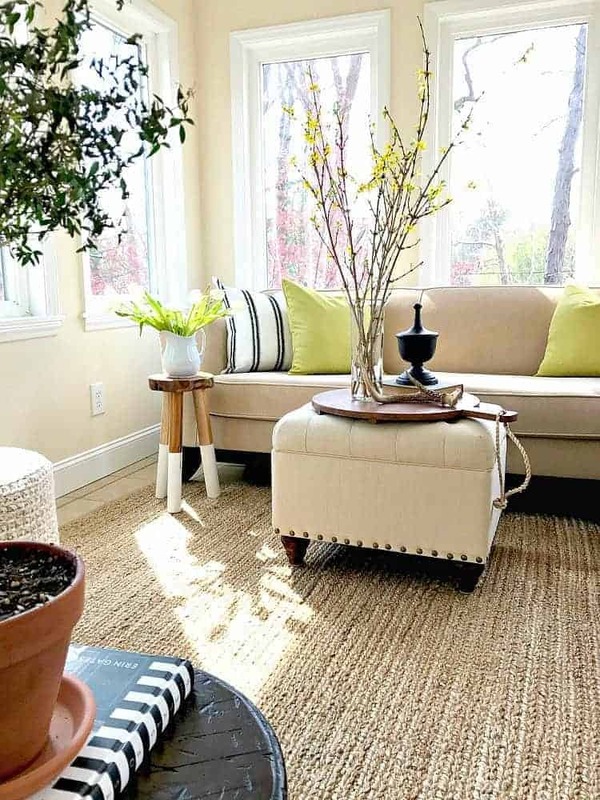 Your home looks quite beautiful for spring. Thanks so much, Mimi, I appreciate it! Hope you have a great weekend! Your home is so lovely. And, I, too enjoy flowers more than a snack. Love your photographs of your lovely home. This post was fabulous! Thank you for all your time and effort. All looks nice, I do these same things, but have to do something all the time , big giant house here. We are used to it but is a bit of work. We have considered downsizing but could never get the views and space we have for the price we paid 23 years ago, not even close. Have you done a post about the ceiling fixture you decided on in the kitchen?…just wondering 🙂 Those red flowers so pretty. I like the white lamp too. We used to have a large house too and I know how much work they are. It seems like you can never catch up. I don’t blame you for not downsizing. Sounds like you have an awesome place. I didn’t share about the kitchen light fixture yet. I think I found a winner and I’m hoping to share it next week. I agree, your photography is excellent. I’ve told you before how much I love your little cottage, so won’t ramble on about that again. 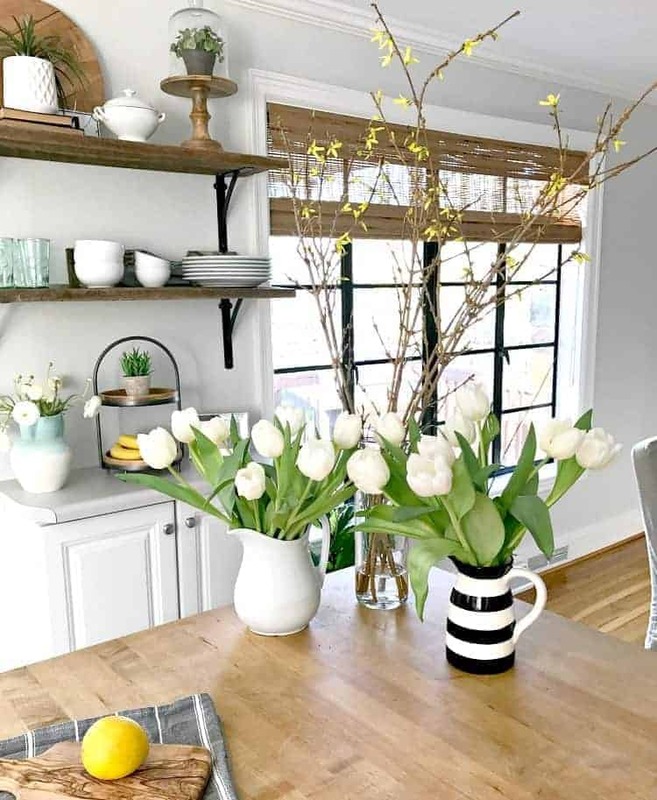 This time I was stunned by the red tulips in the black & white striped pitcher. Just so lovely and artistic. 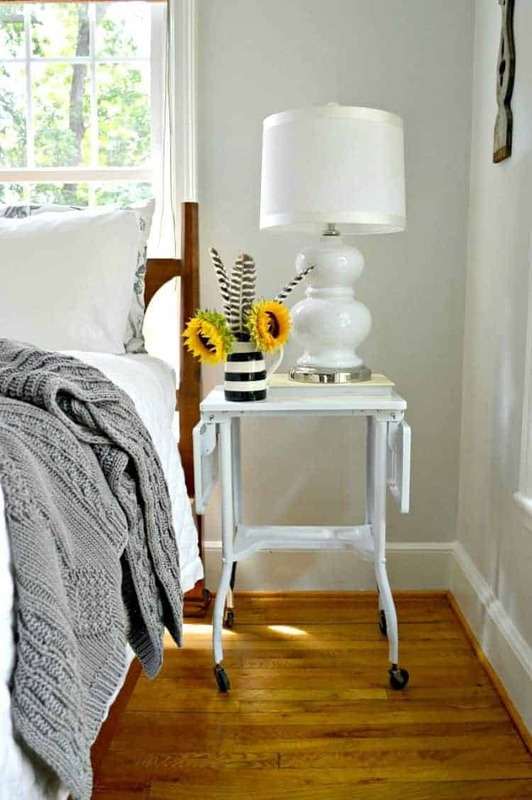 My Spring cleaning usually starts with my master bedroom (I love alone). It is the room most in need of deep cleaning after a long winter. I have a large (75lb) german shepherd mix dog who sleeps with me every night, naps on the bed during the day, and also lays on the end of the bed to watch what’s going on in the neighborhood. As you can imagine – doggie dander and hair overload on a regular basis. I’ve even tried to Spring clean my room and put up a baby gate to keep her from using it ALL day long – at least a little while – but in the end, she gets to use it as she pleases. Your home looks spotless – I’m so jealous right now. I’m glad you enjoy my photos but they can be deceiving. My home isn’t always perfect and spotless. I always have 3 or 4 projects going at a time so it’s usually messy. I try to keep it cleaned up so I can take photos but it doesn’t last long. 😉 I’d rather do projects than have a clean house any day. Thanks for stopping by for a visit. Hope you have a great week. My favorite part of spring is opening the windows and letting the fresh air clean all the stuffy winter smells away. Of course that means dusting every day but I would not change that fresh air for not dusting. I love fresh flowers too but have to for go them because of allergies. Instead I try to plant flowers where they can be seen from my chair when I relax or sit on the porch. Enjoy your fresh clean home and your week. That’s too bad that you can’t have fresh flowers, Debbie, but what a great idea to plant them so you can see them when you sit on your porch. Hope that you are enjoying spring in your new place. Have a great week! Kristi, I don’t know which compliment to share first! 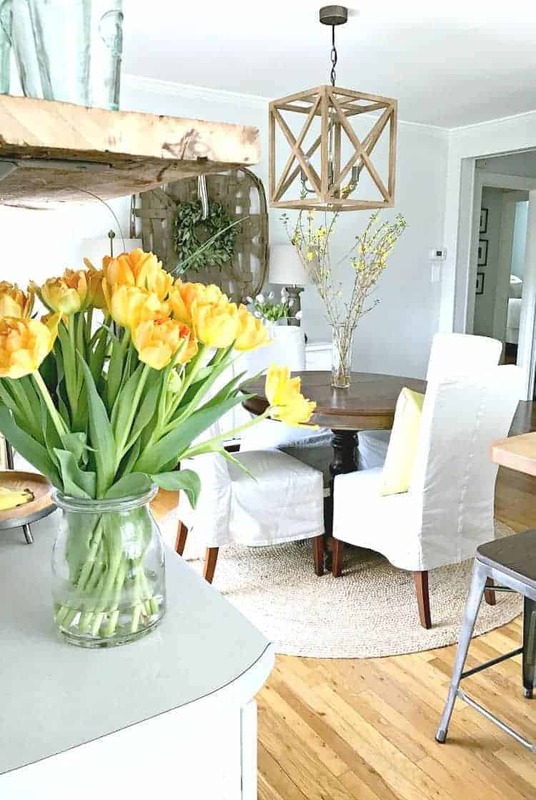 I love all the spring touches all over your cottage, especially the fresh flowers sprinkled all over the house! Your idea of buying flowers in lieu of snacks is pure genius, I think I will try that in my home. Finally, I love your photographs, the composition, the lighting and the amazing clarity really make you feel like your standing in the room!! Happy Spring!! Wow, thanks so much for the sweet comment Kaycee! Photography has a steep learning curve, for me anyway, so it’s nice to know that you enjoy my photos. Thanks for visiting. Happy Spring!!! Your house looks fabulously clean and so does your new site design! I did our bedroom spring cleaning done when we were having warm weather back in Feb. Now if I can just make my way around to the rest of the house! Kristi, everything looks very fresh and springy. I was swapping out the winter clothes for the warmer weather clothes and bagging up what I haven’t worn in awhile, too before my accident. Now it will be slow go finishing since I can’t walk upstairs. I guess I will have to ask the mister to carry stuff up for me that I didn’t finish. BTW, your photos are fabulously clear. What camera and lens do you use? I may buy another new lens this year so am just curious. Thanks Kim. So sorry about your accident. I’m sure Mr. Savvy is taking excellent care of you. As for my photos, I’m using a Nikon d3200 with the lens that came with it. I would like too have a new lens but I’m having trouble finding one that works well in small spaces. I love the words fresh and clean! 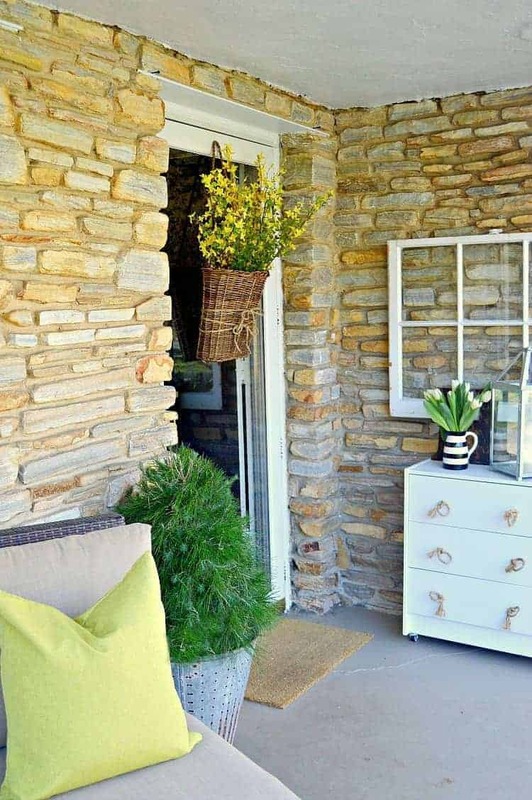 Your cottage looks amazing, Kristi! Love all of the Spring touches. I too love to splurge on flowers every week. It just makes me smile! Happy Spring! I love to spring clean. Just love how the cottage looks and smells with all the winter grime eliminated. Now I’m anxious for it to warm up enough so I can open up all the windows! Your cottage looks great, Kristi.